August was a tumultous month for the Phillies. 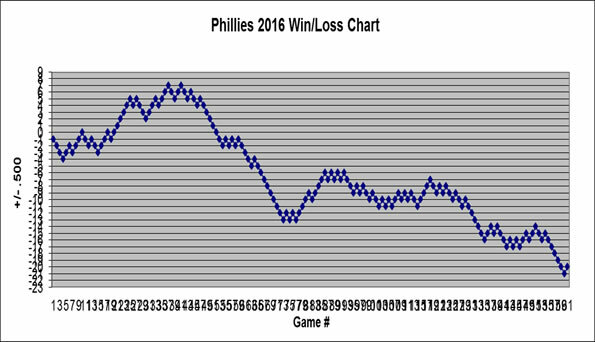 The Phils losing ways from July spilled into August as the Phillies lost 13 of 14 games and fell to as low as 16 games below .500. They then watched Charlie Manuel get fired and replaced with Ryne Sandberg. Will Roy Halladay become Jamie Moyer or Steve Carlton? Most people cringe when they hear Roy Halladay say the M-word (Moyer, of course), but not me. Jamie Moyer is one of my favorite pitchers of all-time and do you know why? Because he won with effort and smarts, not super human, God-given ability. I’m fascinated to watch Doc attempt to transform himself for the second time, because if he can keep his ERA under four with this velocity, it might be more incredible than his 2010 and 2011 seasons where he posted ERA's of 2.44 and 2.35. In the 12 games in September, Ryne Sandberg has penciled in the names Asche, Ruf, and Hernandez together 10 times. The Phillies have won 6 of those games with the three names I mentioned scoring 20 of the Phillies 50 runs (40%), knocking in 19 (38%), and accounting for 35 total runs (70%). Are these three (along with Dom Brown) the core of the future? Are we witnessing stars before they become stars? Or is it Steve Jeltz all over again? Nobody knows for sure yet, but that shouldn't stop us from looking, so let's take a closer look at Asche, Ruf, and Hernandez. At the very least, it might provide a little incentive to watch these last few weeks of Phillies baseball. The numbers for all three are pretty good. Asche is hitting .260 with 5 HR and 20 RBI, Ruf is hitting .250 with 13 HR, 24 RBI, and a .833 OPS, and Hernandez is hitting .290 with a .368 OBP. Here’s what those numbers would look like over a full season. 23 homers for Asche and 36 homers for Ruf plus a .295 average for Hernandez ain't too shabby. That’s a decent start to a career for each of these guys, but they would not be the first to perform in a pressureless September and later escape into oblivion. What matters to Phillies brass is what they will do rather than what they have done. That’s why we should dig a little deeper to find out. Ryne Sandberg is making a solid case to have that interim tag ripped off his back in place of a full-time big league manager label. Sandberg inherited a 53-67 Phillies team and transformed them into a winning ball club. The Phillies are 16-13 since Sandberg's promotion, tying them with the Dodgers for the 6th best record in baseball during that time span. His success is a particularly impressive feat considering the roster Sandberg is working with. His daily lineup includes four starters who began the season in the minor leagues (Asche, Ruff, Galvis, Hernandez) along with several bench players (Mayberry, Frandsen, Bernadina, Martinez, Orr) enjoying regular playing time. Let's examine his miracle juggling act by focusing on his lineup cards. Here is a list of the players used for each of the spots in the starting lineup during Sandberg's 29 games as Phillies skipper. He’s boring. He doesn’t talk. He has absolutely no personality. Pretty much sums up your initial impression of Ryne Sandberg? That is probably not far from reality. Heck, Shawon Dunston, his former double-play partner, said their verbal exchanges were limited to “I got it/you got it” and “who covers the base?” For such a quiet and unassuming man, you had to wonder how Sandberg even got this far. But the Phillies sure liked him. They have been grooming Ryno for years now and don’t listen to anyone who tells you otherwise. He was their man all along and an interim tag was there just to ease the tension of firing the winningest manager in team history. Ruben went to the extent of plopping Sandberg on the bench right beside the guy whose job he eventually stole. Charlie didn't put him there, Ruben did. His resume was perfectly fine and he did a swell job in Lehigh Valley, but why the rush to bring Ryno in? Not a single other team showed the faintest interest and even the Cubs passed on him in Chicago where the dude is a legend. Yet the Phillies were so infatuated with Sandberg that they were willing to let him budge in front of the second manager to ever win a title for the Phillies. Here we are a month later - the Phillies are 18-17 under Sandberg and playing inspired baseball. People like me who criticized the distasteful firing of Charlie and questioned the Phillies allegiance to Ryne now applaud yesterday's announcement that he will manage the Phillies for at least the next three years.